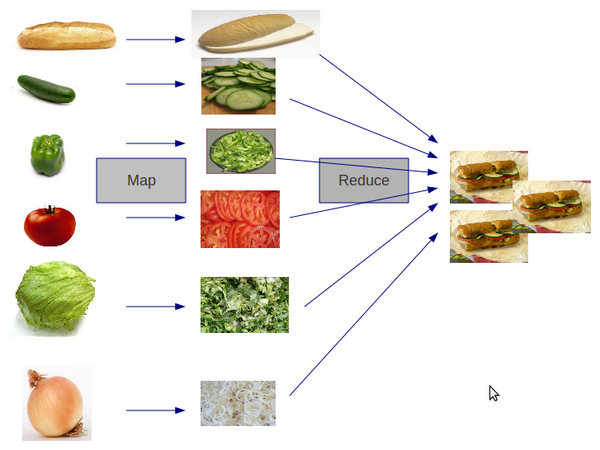 A common pattern when manipulating lots of data can be described using the Map-Reduce Sandwich analogy. Define a collection of strings where each string represents an ingredient. Then you could write a sliced function that adds the string "sliced" to the start of each ingredient. You could then use the reduce function with a function to join all the "sliced ingredient" names into a sandwich (string), perhaps with a comma as a separator interposed between the sliced ingredients.